The armed conflict in Colombia, which lasted more than 50 years, gave rise to nearly 6.9 million internally displaced people, 87 percent of whom came from the countryside. The municipalities most affected saw 3 million hectares of forest lost, which account for 87 percent of the areas where illicit crops have been grown in the country over the past decades. The predicament of rural Colombia is particularly difficult, and the difference in the quality of life between urban and rural areas is staggering: There are approximately 2.7 million farmers in the countryside and almost 45 percent of them live in poverty, with small- and medium-sized growers being the most affected. Once Colombia achieves lasting peace, its annual economic growth rate is expected to rise by 1.1 to 1.9 percent, primarily as a result of a boost in confidence about the country´s future. Faster growth should generate an estimated 120,000 to 200,000 new jobs over 10 years. 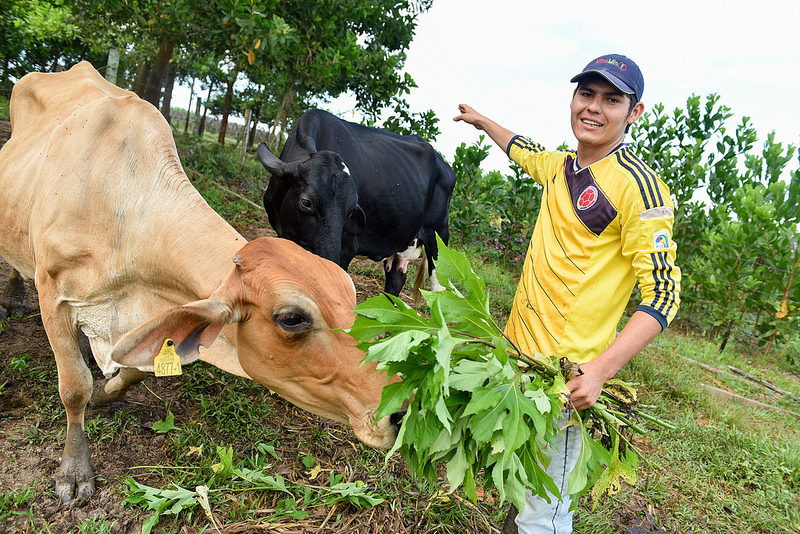 Colombia is currently using only about a third of its available agricultural land, according to the national Rural Agricultural Planning Unit (UPRA). In addition, much of Colombian agriculture is characterized by low levels of technology, largely because the presence of guerrillas deterred investment in isolated farms vulnerable to extortion. 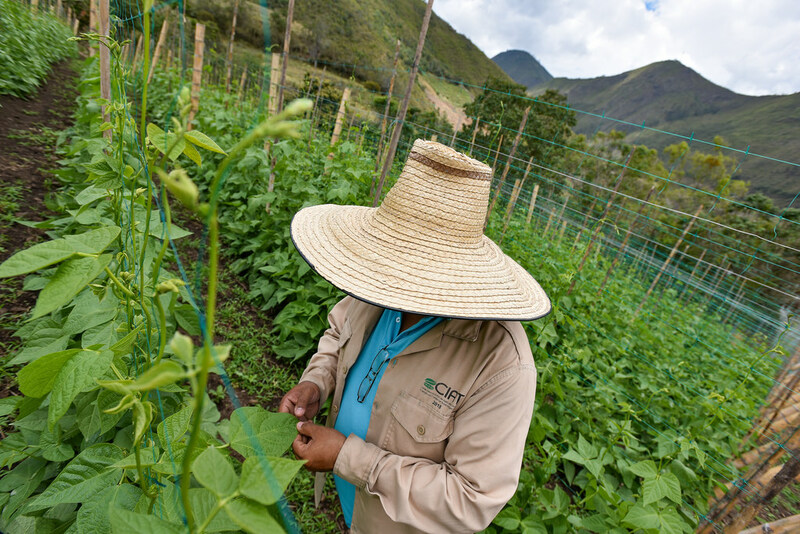 The post-conflict scenario offers a unique opportunity for CIAT to support Colombia, its host country, by providing scientific and technical advice through various strategic approaches. Remolinos del Caguán is a remote town of Cartagena del Chairá in the department of Caquetá in Colombia. Although it has no more than 500 inhabitants, Remolinos has been, sadly, at the core of the national armed confrontation. Farmers in Remolinos, nestled in the Amazon jungle, used to make a living by growing coca. But when the military operations to counter drug trafficking began, coca stopped being profitable, and farmers were at a loss as to how to move forward. Seizing the opportunity to realize his dream to replace the green leaves of coca for the intense red of cacao in the local landscape, local parish priest Father Jacinto Franzoi created the cacao farmers’ cooperative of Remolinos del Caguán and Suncillas (Chocaguán). Legal representative, Chocaguán, which has 34 associates today, with an annual production of ten tons of cacao. 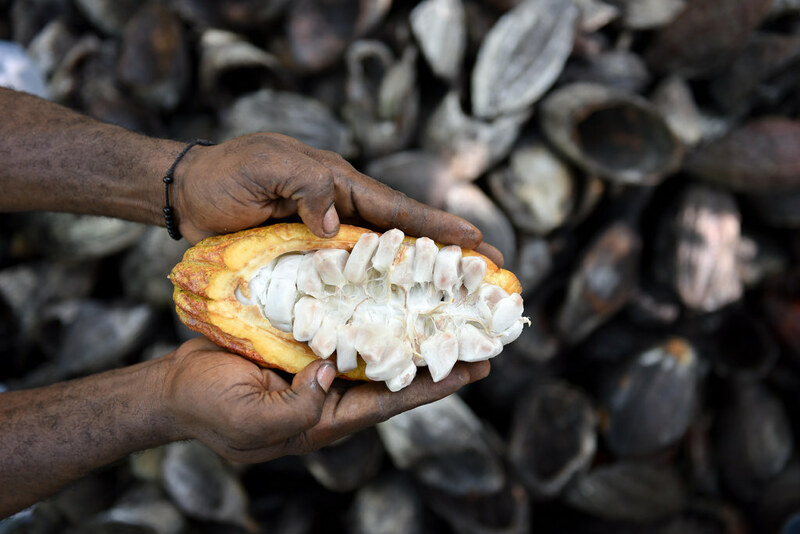 However, the potential of cacao in key post-conflict zones is not a sufficient argument in and of itself to promote cacao farming as an alternative for generating income among small-scale producers. 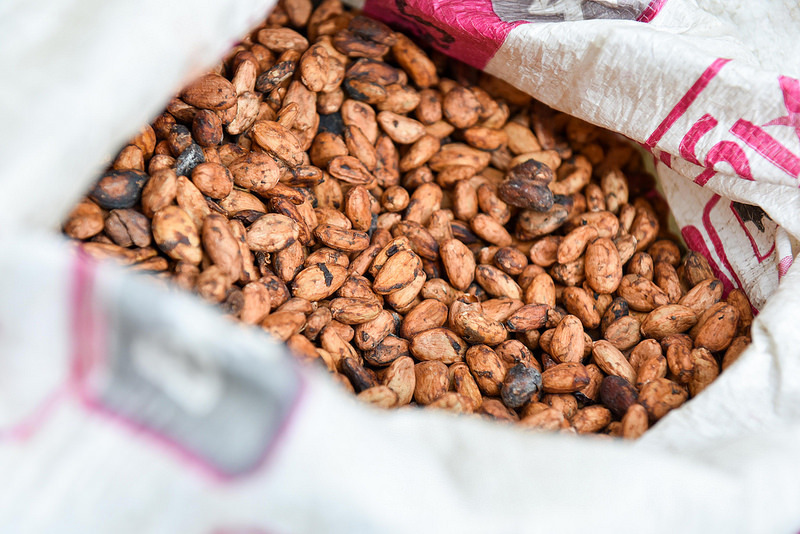 More and better arguments are required in order to think about cacao as a possible component in a competitive, profitable, sustainable, and socially inclusive agricultural sector in the country. For that reason, Purdue University and CIAT have developed, over the course of a year or so, an analysis of the cacao value chain in Colombia, commissioned by the United States Department of Agriculture (USDA), in the context of the Cacao for Peace initiative, financed by the U.S. Agency for International Development (USAID). 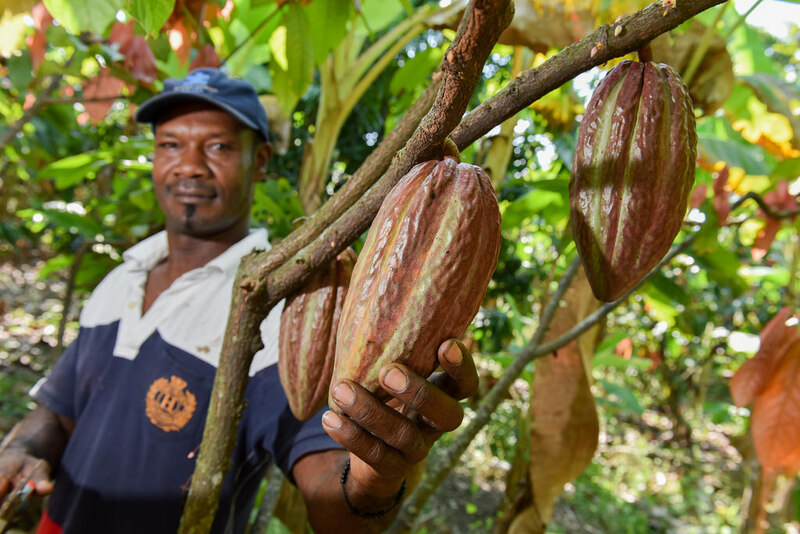 Launched in June 2017, the Cacao for Peace initiative seeks to enhance the cacao value chain over the next five years as part of Colombia’s post-conflict development strategy by strengthening public and private sector institutions that are key to producing this crop. The study found that the cacao sector in Colombia falls short of its potential. Recent efforts to promote it have focused more on the expansion of cacao production. The authors proposed instead a different strategy to clarify the roles and responsibilities in the sector in order to avoid overlapping work and promote coordination and collaboration between the national and regional actors, with key incentives to improve practices, as well as a better articulation between the national policies and the relevant investments for the sector. 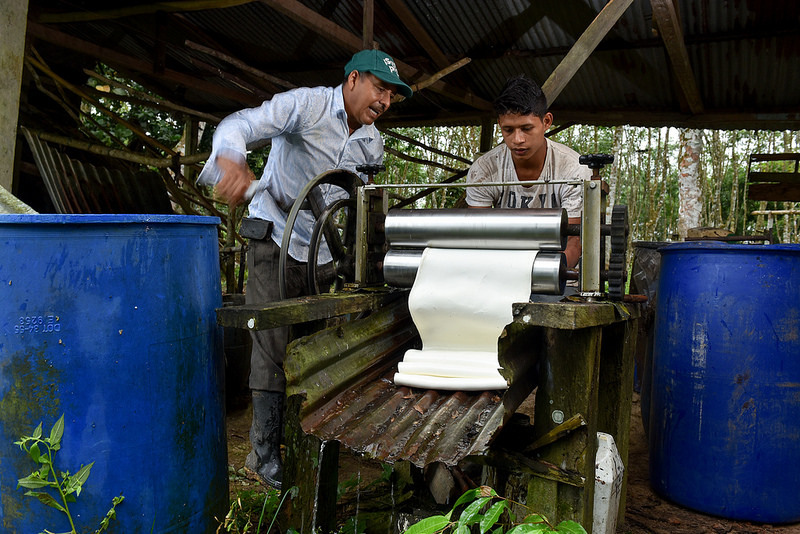 Identify leverage points in the cacao value chain in three regions of the country: Sierra Nevada, Santander, and northern Cauca. Model climate suitability to project medium- and long-term changes under new emissions scenarios. Currently, at least 25 countries which are promoting policies at the national level to reduce greenhouse gas emissions produced by the loss and degradation of forests (sponsored by REDD+*), are, in turn, experiencing – or are just emerging from – armed conflicts. Colombia is one of them. At the UNFCCC COP15 Summit in Copenhagen in 2009, then Colombian President Álvaro Uribe Vélez noted the value of engaging 90,000 families in the country’s rural areas as forest rangers in order to curb illegal coca leaf production – a major cause of deforestation, and therefore, carbon dioxide emissions. “Before they destroyed the jungle to plant narcotics, now they take care of the jungle … they are committed to keeping the areas free of illicit drugs,” Uribe said. It was a compelling idea: the existence of a strong connection between coca production, conflict reduction, and REDD+. But at that moment, there was absolutely no scientific evidence for the link. Augusto Castro-Nuñez, an agricultural engineer with a doctorate in geography and then a climate change negotiator for Peru, thought: If we can show evidence for linking REDD+ and peacebuilding, it could mean we get the political support – beyond just the environmental sector – to implement REDD+ in the many countries experiencing or emerging from conflict. Searching for the link became the basis of Castro and his collaborators’ research for the next six years. And they found the evidence. 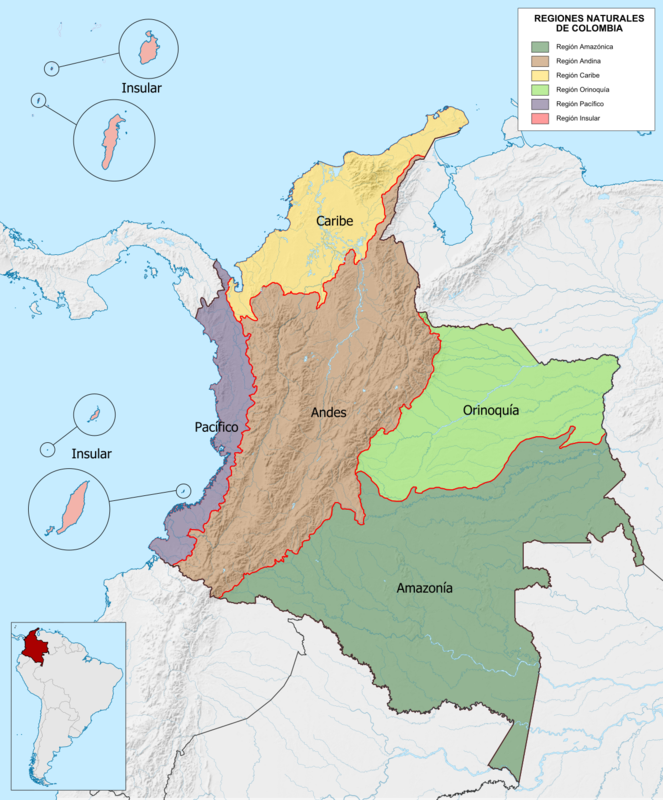 Their work, published in the journal Environmental Research Letters in 2017 builds on information gathered from municipalities of the Caribbean, Pacific, and Andean regions, Antioquia, Santander, Orinoco, and the coffee belt in Colombia. According to the research, given the compatibility of the efforts related to the construction of peace with REDD+, it is reasonable to hope for beneficial interactions in places where these activities overlap, and actions could be promoted so that the activities that are proposed by various stakeholders may converge toward a common objective. Promoting approaches to building peace and reducing carbon emissions from deforestation may also achieve another important global and national objective: producing food without cutting down more trees. Colombia’s current president Juan Manuel Santos is now also linking the country’s peace process with its climate change policy. And international organizations are listening to the political discourse and putting the scientific evidence behind such a concept into practice too, such as in Colombia’s Orinoquia region. Despite the peace agreement, organized crime bands, reportedly made up of ex-paramilitary group members, are still prevalent in the area, and so is deforestation. As part of its efforts to achieve zero forest loss, the Colombian government is working to stop deforestation in the Colombian Amazon with the support of the governments of Norway, the United Kingdom, and Germany. And they believe that the Orinoquia region has the potential to contribute to reducing countrywide carbon emissions, as well as to become a breadbasket for the country and beyond. The World Bank is also looking at Orinoquia as a region that can help mitigate climate change and address the causes of armed conflict in Colombia. It is specifically examining how the BioCarbon Fund’s Initiative for Sustainable Forest Landscapes can help the Colombian government reduce emissions from agriculture, forestry, and other land uses there. It is also exploring whether such financing can incentivize sustainable food production and long-lasting peace. The Orinoquia region can provide evidence on how carbon finance can foster sustainable food production and actually limit the areas for farming to those already deforested. 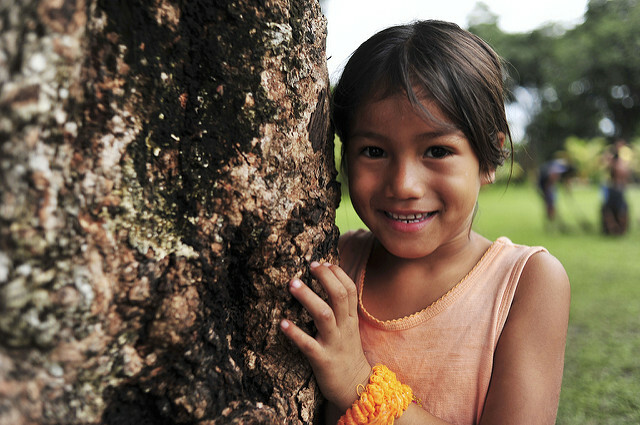 CIAT is now studying sustainable land systems that contribute toward reducing emissions from deforestation with peacebuilding in the region. * The United Nations initiative that incentivizes the reduction of carbon emissions from deforestation and forest degradation in developing countries. Colombia’s Amazon Vision Program has set itself a goal of reaching zero net deforestation in the region by 2020. To that end, it focuses on five pillars for action. 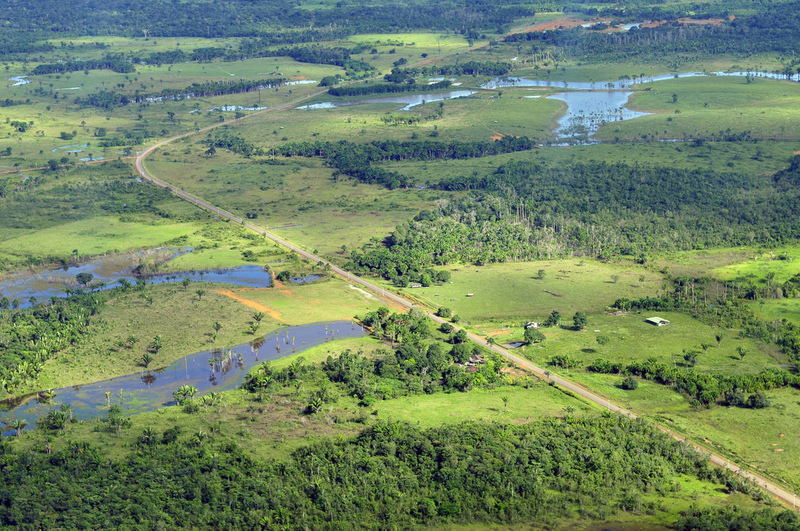 Pillar 3, Environmental Development, responds directly to the drivers of deforestation associated to the expansion of the agricultural border and is under the responsibility of the Ministry of Agriculture and Rural Development (MADR) and the Amazon Scientific Research Institute (SINCHI). Implementing demonstration models in silvopastoral systems with different arrangements, taking into account livestock and plant species native to the area, in addition to multipurpose forages (sustainable livestock farming), among others. Establishing multi-actor platforms and defining sectoral strategies for supply chains in the case of cocoa, rubber, non-timber forest products, and dual-purpose livestock, with a focus on the sustainability of the Caquetá and Guaviare Departments. During a visit to CIAT in October 2017, former combatants from various illegal armed groups who are in the process of reintegration to civil life, with ages ranging from 19 to 43 years old, learned about new opportunities to generate income now that they have decided to leave arms and reconcile with society. At CIAT, they discovered options for a productive, sustainable agriculture, how to establish seedbeds or manage nurseries. They learned about seed production, the bean varieties that can bear greater yields in certain regions of the country, how to produce cassava flour and add value to the process, how to establish sustainable silvopastoral systems while improving their productivity, and even how to identify market opportunities and turn their projects into business models. “Do you sell these seeds at CIAT?” asked Claudia* when she was at CIAT’s experimental field of biofortified beans, along with a group of 28 fellow students. 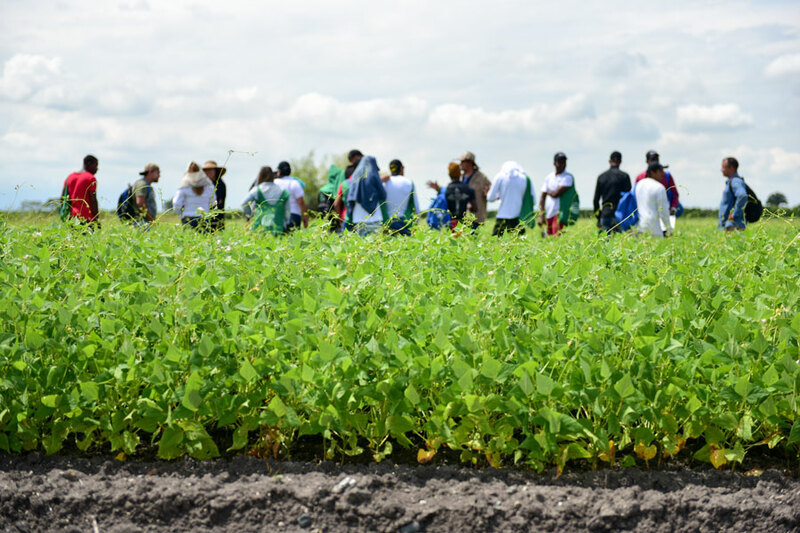 She was surprised to see bean plants so green and leafy, despite the harsh temperature of 30 degrees Celsius that at 10:00 in the morning hit the extensive plot. But CIAT provides all plant materials (as seeds or plantlets in test tubes) free of charge to any individual or organization under the terms of the International Treaty on Plant Genetic Resources for Food and Agriculture (ITPGRFA). During a previous visit, Rafael Pardo, Senior Presidential Advisor for Post-conflict, Human Rights and Security, also learned about the work in applied agricultural research that CIAT has been advancing for the past 50 years, which could be key to the current post-conflict stage in Colombia. “The government does not want farmers to grow crops merely to risk an adventure or to follow a fashion trend, but to grow well-researched crops, intended for a guaranteed market, with a technological package behind them; and right there, CIAT’s work from the critical core of research and in association with the Colombian Corporation for Agricultural Research (CORPOICA) and other partners is very important,” said Pardo. CIAT scientists shared with Pardo successful stories of sustainable production chains based on inclusive business models for crops such as cacao, rubber, non-timber products, dual-purpose livestock, coffee, and quinoa, which can be scaled out under the National Integrated Program for the Substitution of Illegal Crops in subnational regions such as Nariño, Guaviare, Caquetá, and Meta. Pardo also visited experimental fields where CIAT scientists briefed him about biofortified, drought-tolerant, higher yielding varieties of beans, cassava, and rice, which can be used as an effective, low-cost strategy to tackle the challenges of food security, nutrition, and income generation. They discussed strategies to work with the communities for organizational strengthening, interaction with local entities, and quality seed production. 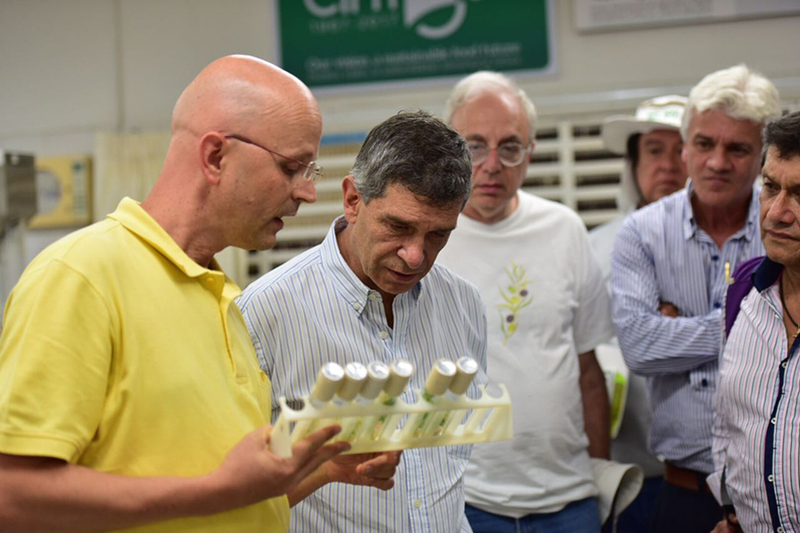 The visit came to an end at CIAT’s genebank, where Pardo seemed gratefully surprised by its huge capacity to harbor more than 67,000 accessions of beans, cassava, and tropical forages for conservation and distribution not only for users in Colombia but all over the world. 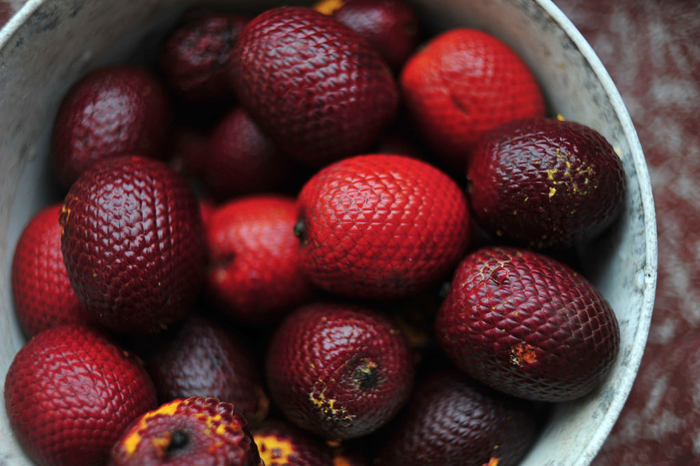 “There are an estimated hundred thousand coca producers in the country, who are looking for different alternatives. This requires decentralized planning strategies; the decisions on how to move forward cannot come as an imposition. It has to be a process in which no one risks an adventure,” said Pardo. *The interviewees’ names were changed at request of the sources.